The Alsace AOC (Appellation d’Origine Contrôlées) was established in 1962 and its fairly stringent winemaking requirements reflect the pride and ambition by Alsatians to codify their vinicultural expertise. Anchoring the north-east corner of France, this is the largest of 3 related appellations; representing 75% of the region’s vintners; sharing geography with a smaller group of select estates that carry the AOC designation Crémant d’Alsace (sparkling) or Alsace Grand Crus. Their output of varietal whites such as Sylvaner, Riesling (Dry), Gewürztraminer, Muscat d’Alsace, Pinot Blanc (Klevner), Auxerrois Blanc de Laquenexy, and this week’s DéClassé featured Pinot Gris are widely regarded as the benchmarks for more fulsome versions of the sometimes, lightweight wines produced elsewhere. In embracing the challenges of high AOC standards, particularly the preference for quality over quantity, Alsatian vintners are guarding the regional character that’s taken centuries to forge. Arguably, they remain in a leadership role for the cultivation/refinement of these cool climate grapes and wine styles; just ahead of burgeoning competition across the German border! Alsace’s most reputed wine-producing district is the geographic portion called the Haut-Rhin (Upper Rhine). Centered on the ‘wine capital’ town of Colmar, its vineyards line the foothills of the Vosges mountains and roll out onto the adjacent river plain. Conquered by Caesar in the 1st century BCE, this was a desirable agricultural tract in the Roman province of Prima Germania for about 600 years before becoming part of a Frankish Duchy in 496. After a long period of acting as a buffering borderland region in the Holy Roman Empire, it was annexed by French troops in the late 17th century as a territorial spoil of the 30 Years War. For the next 350 years, this contested strip of land traded Franco and Germanic occupation before settling as a hybrid people/culture within modern-day France; so it also is with their traditions of fashioning wine. 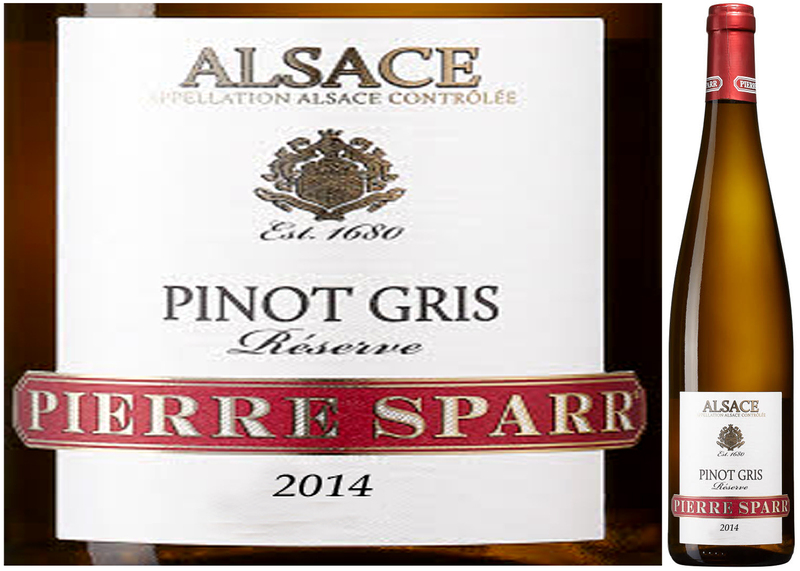 Amid this latter period of regional history, lies the familial legacy of Jean Sparr and the 9 successive generations that have culminated as one of Alsace’s best-recognized producers, the Maison Pierre Sparr Successeurs. Their modern renaissance begins after the devastating 2nd World War, during which the family’s village of Sigolsheim and its surrounding vineyards were largely razed. Rebuilding the long-held family estate and replanting 15 hectares of vines, in time, has led to an expanded collaboration with other dedicated local growers and the current, and very capable cellar master, Alexandra Boudrot. 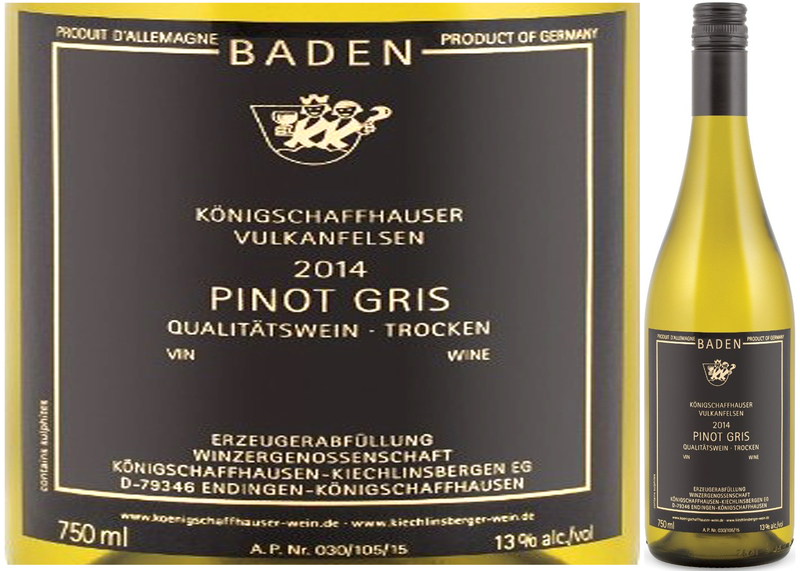 Judging by the mid-grade offering of Pinot Gris Reserve 2014, the reputation of this consistently accomplished winemaking dynasty remains well deserved; with a future that’s distinctively dressed in a tall and slender bottle called a Flute, and its content that has a bright straw-coloured hue! Plush and soft, with layered aromas of apricots, honey, and spice, this fruity wine also incorporates citrus and a dose of minerality to refresh the palate. Though well-suited to a traditional gastronomic mix of Choucroute à l’Alsacienne (pickled cabbage, steeped potatoes, and assorted smoked sausages), Pâté de Foie Gras (goose liver paté with truffles, wrapped in pastry) and Flàmmeküche (flatbread with crème fraîche, onion, and lardons), it would also add a tangy balance to spicy Asian cuisine loaded with fresh vegetables. Try the latter pairing first; well chilled! success on either side of the river is the cultivation of Pinot Blanc, Pinot Noir, and this week’s DéClassé featured grape and varietal wine, Pinot Gris. In Baden, these varieties thrive in the mineral-rich soils that have settled on the lower slopes of long dormant Vulkanfelsen (volcanos). 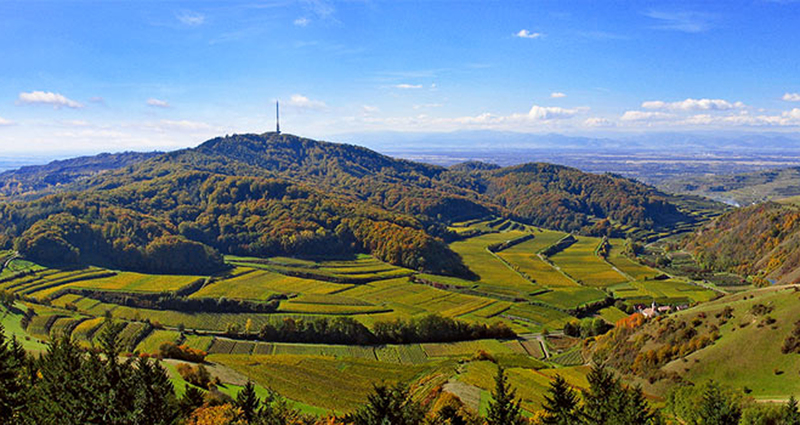 For the vintners of Königschaffhausen and their 2014 Pinot Gris, fruit is sourced from vineyards on a cluster of hills that are auspiciously titled as Kaiserstuhl (the Emperor’s Throne). 85% of Baden’s output is bottled by small winery cooperatives and is the only German region subject to the higher EU Zone B wine standards, which also apply to premier producing areas such as Alsace, Champagne, and Burgundy. As for the current range of German wine exports, the industry is still working to counter the associations by North American consumers that they only produce various types of Riesling; particularly, sweeter versions. Gradually, with the help of Pinot Gris (locally known as Ruländer or Grauburgunder), the healthy diversity of wines being exported is tempering this outdated impression. As a compelling example, this dry, silky and elegant bottling demonstrates a level of quality and character that puts many popular whites such as Soave and Pinot Grigio to shame for their lack of distinction. As a time limited release to LCBO’s Vintages, this week’s recommendation is on many ‘best of the month’ lists, so will require some Olympian sprinting to get to the shelves before it’s gone until next year. If you are a white wine lover, don’t hesitate to buy half a case. If you’re an intransigent red wine lover, then only buy 3, so you have something truly interesting to offer your white wine-loving friends! Delicate aromas and flavours of citrus and stone fruit make this dry, mid-weight white a fabulous apéritif wine with pâté, soft cheeses, asparagus with a white sauce or with main courses of roasted poultry, smoked fish, and baked hams.